Despite living in Beijing, one of China’s richest cities, she lives a hand-to-mouth existence, earning money by collecting rubbish and reselling it. The 1500 yuan (US$227) a month she makes has to feed three — her husband who suffers from a mental illness and does not work, her 10-year-old granddaughter Feng Aobin and herself. Toilling from 7 a.m. to 11 p.m., Wang works for six to seven days a week. She says what she makes is only enough to eat two meals a day, while rent and school fees for her granddaughter who was abandoned by her parents are a constant worry. This picture taken on February 16, 2017 shows an elderly woman burning trash, as she cleans the streets for 117 USD per month, in the Heiqiaocun migrant village in Beijing. 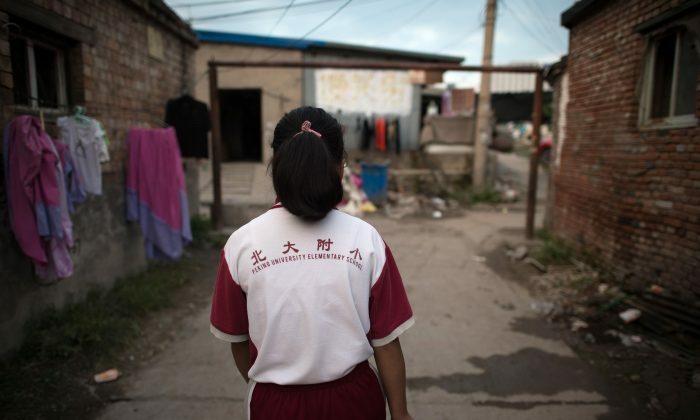 But like many other migrant workers, Wang receives no assistance from the state, falling through the cracks in a system which only entitles citizens to collect the vast majority of benefits in the location where they are registered. “When I started here the monthly rent was 300 yuan ($45) a month, now it’s 700-800 ($106-$121) a month, I can’t pay it. Every month you still need to live, I still need to pay the school fees for the child, and her food and drink every day, I can’t take it, my whole body aches, I can’t earn the money, I’m thinking about this every day, I can’t look after the child, it’s just me by myself, I can’t do it,” Wang told Reuters, wiping away tears. Chinese President Xi Jinping made the poverty alleviation campaign one of his signature policy issues after pledging in 2015 that China would lift the country’s 70 million people living under the poverty line out of hardship by 2020. The campaign has been ratcheted up as the ruling Communist Party prepares to hold a 5-yearly leadership meeting this month. But while the programme is credited with focusing attention on improving areas like rural infrastructure, problems remain, and China’s huge migrant population have missed out on many of the benefits. Wang, for instance, is technically above the poverty line, but she still doesn’t earn enough to feed her family adequately and put a roof over their heads. The government’s poverty line is an income of 2,300 yuan per year, and by the end of 2016, 43.35 million people were still officially below it. The government’s goal is to lift 10 million out of poverty this year, and at that rate the country by 2020 should, at least officially, be rid of serious poverty. Central government officials are upfront about the challenges, which they say include misuse of funds at the local level, and inaccurate or skewed statistics on the poor population. And they readily admit the programme is by design narrowly focused on addressing the most pressing problems of the severely rural poor. Migrant worker Wang says local corruption means that she has been unable to claim benefits in her home province. Others, like Mrs Zhong, who is in her nineties, receives only a minimal amount. Though she lives in Beijing, the money is collected by her relatives in her home province of Shandong. “They told me each month I get about one yuan a day, I don’t really remember, each year when I go home I collect a few tens of yuan. This year I haven’t been back to get it yet,” she said. While for Wang every day is a struggle, others like Mrs Zhong take a more long-term view of the situation. “These days the country is stable, we’re not afraid anymore, the rich and the poor can all eat. In the past the poor starved, now everyone has a meal and can go out and make money, in the past even those who worked had nowhere to live,” she said.